When I’m in Atlanta, I rarely take the time to pay Decatur a visit. I have nothing against the town; it’s just not that convenient. Of course all that changed when I heard the siren song of a sausage construction class at Pine Street Market. So, Aaron, Jennifer, and I piled into my car and made the drive across town. With only two tickets between the three of us, Aaron and I actually attended the class while Jennifer caught up on some work at a coffee shop. A few hours and a few links later, we met back up with Jennifer and set about deciding on dinner. There may have been some initial hemming and hawing, maybe even a joke about going back to The Iberian Pig, but having found parking on Ponce, Leon’s Full Service was the answer. I’ve been meaning to eat at Leon’s for a while and now I finally had the chance, if we had the patience. Despite being 9:30 on a Wednesday night, Leon’s was packed. We briefly considered trying Cakes & Ale but cooler heads prevailed and we took a seat at the bar. I’ll be honest, if there was one reason I voted to stay at Leon’s it was their late night menu. It was a fine looking menu, but there was one item in particular that really caught my eye. Near the bottom was poutine. 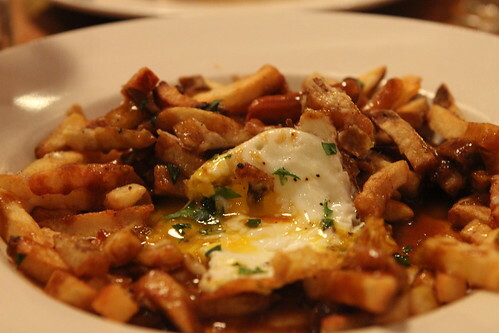 I realize it’s a ridiculous reason, but I love poutine and it is damn near impossible to find a decent example this far south. Reading through some of the Atlanta based blogs, people have written about just how good the fries are at Leon’s. Well, they weren’t lying. 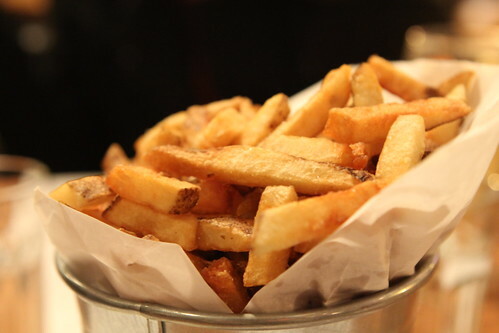 These fries were excellent; they were crispy, salty, and had just the right amount of fluffy texture inside. 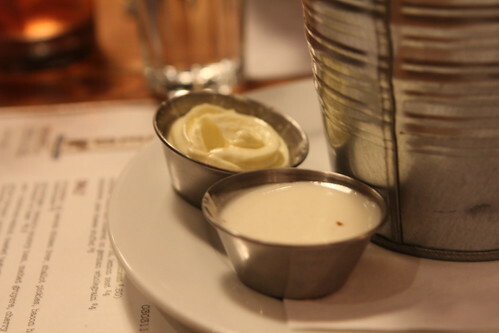 For their sauces, they went with garlic aioli and goat cheese fondue. The garlic aioli was exceptional, very thick and very garlicky. I wasn’t as impressed with the goat cheese fondue. I liked the pungent, tangy flavor of the goat cheese but it was too thin for a good dipping sauce. 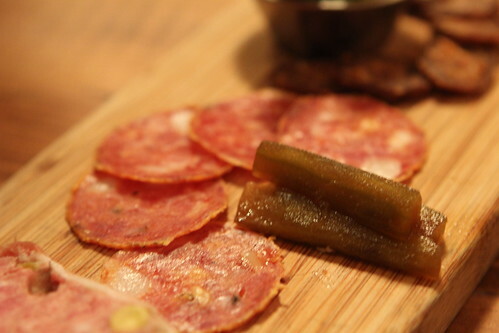 I can never resist the lure of a charcuterie plate. 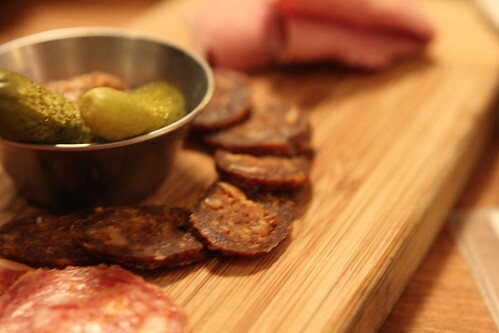 With a slice of terrine, sopressata, mole salami, and mortadella, this plate offered a nice variety of cured meats. When you wrap something in fat, it’s hard to go wrong and this terrine was no exception. 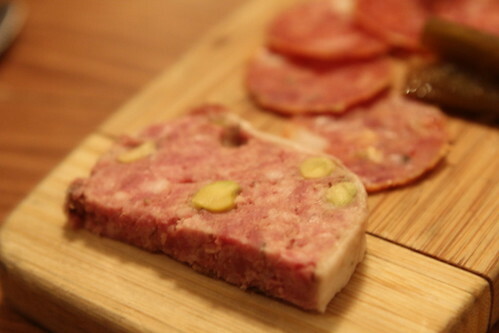 With a very smooth texture, this terrine was all pork with just enough pistachio flavor. The sopressata was a real standout. Fatty, but not greasy, it was a satisfying blend of pork, pepper, and spice. I wasn’t quite sure to expect when I tasted the mole salami but each piece was a surprisingly pleasant mixture of dark, smoky flavors and the heavy taste of paprika. 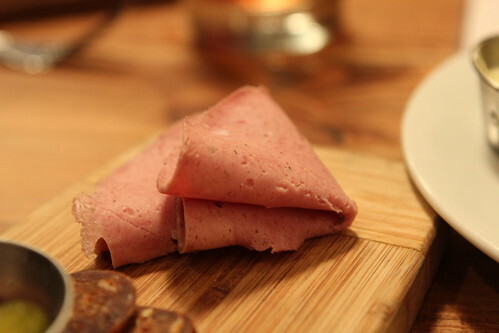 I rarely see mortadella sliced this thinly but it works. 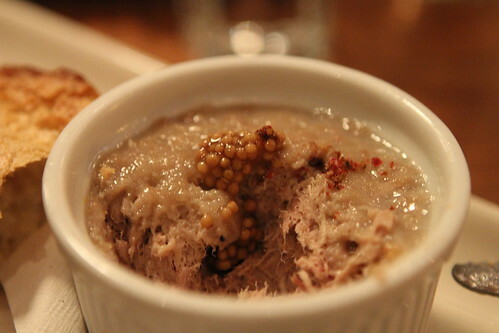 I can never get enough of the smooth taste and texture of emulsified pork with the punch of black peppercorns. As if the charcuterie plate wasn’t enough to satisfy our cured and fat laden cravings, I decided that we had to try the house rillette as well. 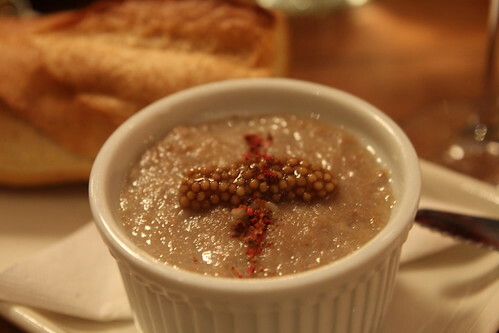 Covered with a layer of pork fat and topped with a little grain mustard, this rillette came with all it needed, a loaf of bread. Actually this rillette was surprisingly dry and outside of the sealing layer, there wasn’t very much fat in the pot. On its own, it was a surprisingly bland, but mixed with the mustard seeds and peppercorns, the sweetness of the pork was much more forward. This is a simple rillette but perfectly passable if you don’t try it right after the mole salami. 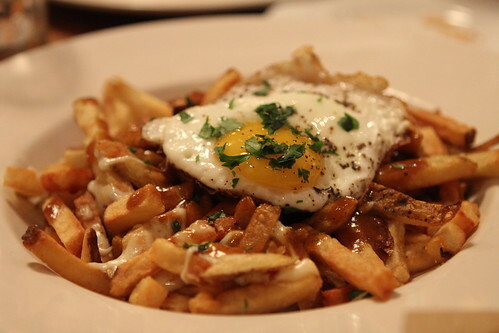 While I was egging Aaron and Jennifer to try a few more of the various pork based delicacies, my order of poutine arrived. It was a little anticlimactic, but once I accepted that there wouldn’t be any wild boar ragu involved, I was quite happy with the combination of Leon’s excellent fries, a beefy gravy, and big, gooey cheese curds. The addition of the egg seemed unnecessary but once I broke the yolk, a whole separate gravy magically appeared. It’s a simple touch but a great idea. Even though the menu was full of appetizing entrée choices, the description of grass-fed beef, Tillamook cheddar, catsup & mustard, bread and butter pickles, and iceberg lettuce was just too tempting. 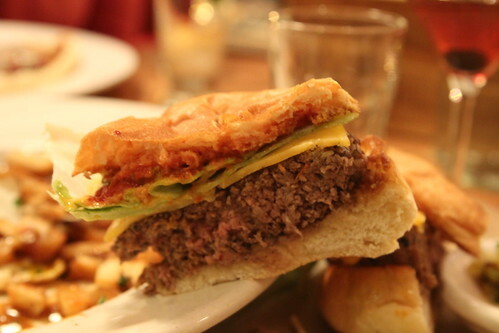 Served with a side of brussels sprout hash, this burger looked the part. The un-melted cheese was an odd touch. I asked for the burger medium rare and I received a juicy, but surprisingly underwhelming burger. 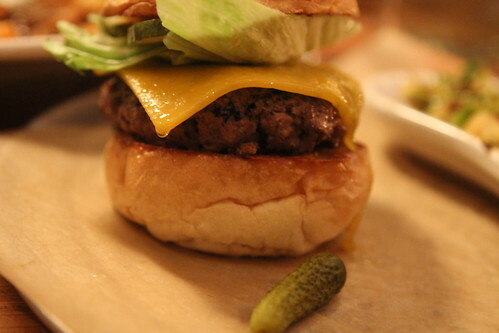 While the burger was well seasoned, there wasn’t a big, beefy flavor or even the more subtle flavors of grass-fed beef, it was just there. 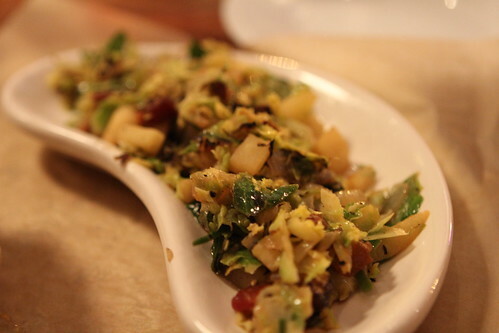 The brussels sprout hash was a different story. This side dish was crispy, crunchy, caramelized, and topped with a distinct, delicious vinegar flavor. 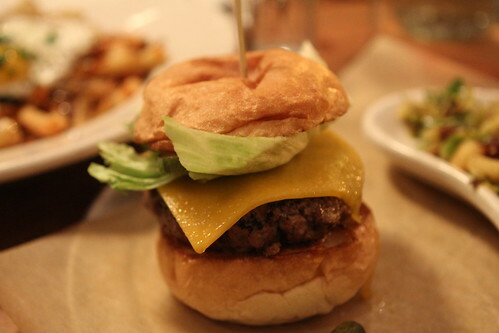 Even with an anticlimactic burger, I enjoyed what Leon’s Full Service had to offer. 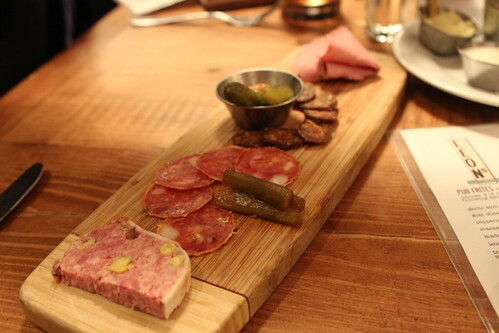 It’s a fairly expansive, ever evolving menu that seems to focus on high end bar snacks and with a special section for charcuterie, I can definitely get behind that. It beats the hell out of picking at the over-battered fish and chips or chicken strips that you’d find at most bars and at the very least, the fries made this a worthwhile visit. They really are as good as everyone says. The real question is would I come pay Leon’s another visit? That’s a tough nut to crack. If I’m in the neighborhood, sure, I’d be more than happy to grab a beer and wait in line, but would I make a special trip? I doubt it. 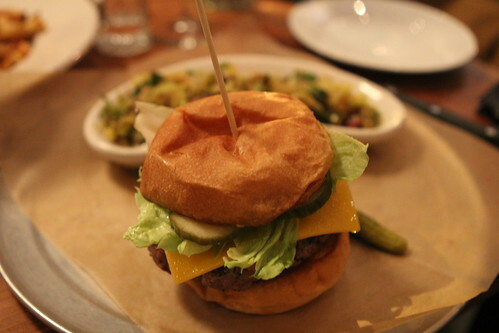 If I’m in Atlanta and I want a Gastropub, I’ll go to Holeman & Finch. If I feel the need to have a beer and play bocce ball, I’ve got Ormsby’s, but the next time Pine Street Market offers a class, Leon’s Full Service will certainly be on my short list. Yep, I ventured into the world of dslr cameras at Christmas. I've still got a lot to learn but it's progress.